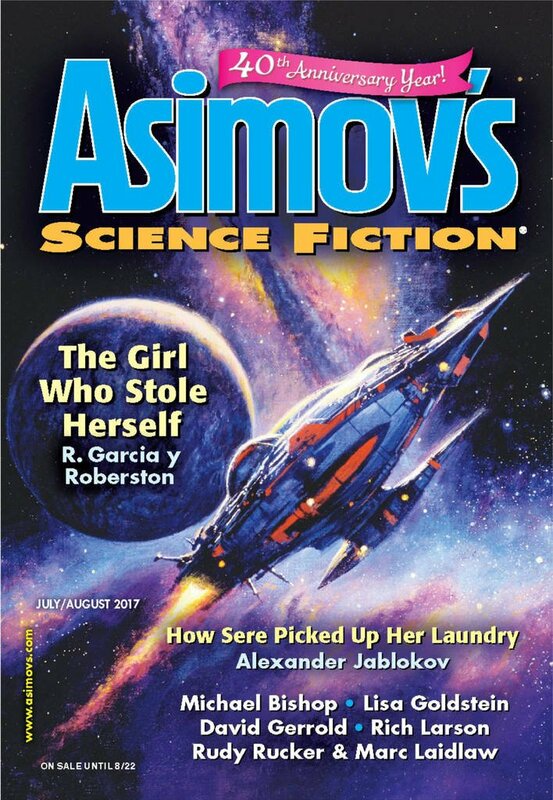 "An Evening with Severyn Grimes," by Rich Larson [bio] (edited by Sheila Williams), appeared in Asimov's Science Fiction issue 07-08|17, published on June 15, 2017 by Penny Publications. Pro: The beauty of this story is the way her agenda and Grimes’s agenda interact. Once we understand that Grimes is wearing her son’s body, we understand her motivations entirely, but from there the fun is watching it all play out. Grimes is tired of life. The boxing match doesn’t excite him. Nothing does. This chase, this adventure is the most fun he’s had in years. This is key to understanding his motivations. So why does Girasol change her plans and let Grimes live? I think the answer to that is Finch. Finch has real loyalty to Grimes, for some reason, but, more important, Grimes saves her life by giving her the “Atticus” code that make Finch trust her. She returns the favor by changing the plan and saving his life too. At the end, Grimes decides he’ll go with a clone body after all, and he blocks the police from tracking down the Fletchers. Part of what makes this change of heart believable is that his contract with Blake wasn’t totally one-sided. In exchange for fifteen years of his youth, he gets enough money to live comfortably the rest of his life. One can argue that that's a better deal that you get at most startup companies today! Con: Girasol takes a heck of a risk letting Grimes live. It stretches disbelief a little. I agree with the rating of 5 stars. This story is highly rated and highly recommended for very good reason. I really liked it. Glad I got to read it in time. Regards the Con RSR listed - I think Girasol decided that Severyn Grimes was less of a risk alive than her other options. That line about the types that could hide her son being very bad news? It is worth reading. Few stories feature a mother as the main character, so that is a bonus. This was very well done - Larson is clearly talented as well as amazingly prolific. Morally, it's beyond appalling. The story expects you to sympathize with a bored, sociopathic aristocrat, a man so jaded that he no longer gets the old thrill from watching two hag-ridden bodies (the riders being other sociopathic aristocrats) beat one another into broken, bloody pulps, fights so brutal that the original occupants of the bodies count themselves lucky to wake up unparalyzed. A man who clearly stalked Blake, the young man whose body he is now wearing - and, one could reasonably infer, steered Blake into drug addiction in the first place to make him desperate. Grimes' great skill, after all, is supposedly his ability to sniff out other people's weaknesses. It seems equally likely to me that Grimes was responsible for Girasol's arrest and imprisonment in the first place. This is, after all, a society in which the government (what little there may be left of it) is so completely in thrall to to oligarchs like Grimes and the corporations they control that convicts (or their families) are required to pay the costs of their imprisonment. Finch has real loyalty to Grimes, for some reason. Probably because it's been engineered into him along with those neanderthal traits. At the end, we're supposed to feel positively toward Grimes for deigning not to crush Girasol and Blake like the insects Grimes and his kind think they are. But the only thing really motivating Grimes at the end is his discovery that being placed in danger is the one thing that really gets him excited again. I predict a variant on The Most Dangerous Game coming soon to an island owned by Grimes. The story isn't helped by the utterly cartoonish religious-cult villains. I do give him props for the "a copy that remembers being me isn't me" line, though. And while I realize your "start-up" comment was thoroughly tongue in cheek, I think a far more realistic outcome would be for Blake to revive after fifteen years to find his body infected with every STD in existence and ravaged by years of drug and alcohol abuse. It was done before and much better by Jack Vance in Chateau d'If. I often see parallels (possibly unintentional) between the characters in some SF/F stories who're effectively enslaved and many workers in the real world. Yes, in theory you can tell your boss to shove it, but in practice a great many people are so dependent on the job and so poorly prepared to handle any term of unemployment that their relationship with management is one where they can't really say no. In particular, young people working long, hard hours for low pay at startup companies really are trading away a big chunk of their youth for what's most often a pipe dream. Anyway, I'm not sure many writers are really exploring this. (They often seem to have rather odd ideas about how companies actually work, especially high-tech ones.) And, obviously, the real world has lots more protections for employees than you'll find in this (and other) stories.